An assessment of water stress and scarcity requires a multi-faceted approach to achieve real water poverty reduction. Several issues impact the ability of people to access to and properly use water and improved sanitation facilities. Among them are the availability of water resources, the capacity of communities to manage the schemes, the economic aspects of services affordability, and the environmental issues. However, they are often treated separately, and not as an integrated, dynamic process. In order to integrate these biophysical, social, economic and environmental issues, as well as the existing pressures and policy responses into one single, comparable, dynamic indicator, an enhanced Water Poverty Index, which uses a pressure–state–response function, has been developed and is proposed in this study. It is primarily designed to produce a holistic tool for policy making, aimed at allowing resource managers to determine and target priority needs in the water sector, while assessing development process. 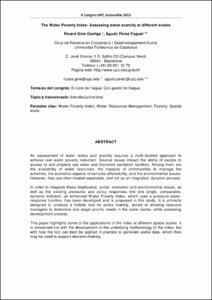 This paper highlights some of the applications of the index at different spatial scales. It is concerned not with the development or the underlying methodology of the index, but with how the tool can best be applied in practice to generate useful data, which then may be used to support decision-making An assessment of water stress and scarcity requires a multi-faceted approach to achieve real water poverty reduction. Several issues impact the ability of people to access to and properly use water and improved sanitation facilities. Among them are the availability of water resources, the capacity of communities to manage the schemes, the economic aspects of services affordability, and the environmental issues. However, they are often treated separately, and not as an integrated, dynamic process. In order to integrate these biophysical, social, economic and environmental issues, as well as the existing pressures and policy responses into one single, comparable, dynamic indicator, an enhanced Water Poverty Index, which uses a pressure–state–response function, has been developed and is proposed in this study. It is primarily designed to produce a holistic tool for policy making, aimed at allowing resource managers to determine and target priority needs in the water sector, while assessing development process. This paper highlights some of the applications of the index at different spatial scales. It is concerned not with the development or the underlying methodology of the index, but with how the tool can best be applied in practice to generate useful data, which then may be used to support decision-making. Giné Garriga, Ricard; Pérez-Foguet, Agustí. The Water Poverty Index: Assessing water scarcity at different scales. A: II Congrés UPC Sostenible 2015: la recerca en sostenibilitat: estat actual i reptes de futur. "UPC Sostenible 2015". Centre per a la Sostenibilitat, 2009.